Georgia Tech and Microsoft Research tested how well kids would play together through video conferencing. (CNN) -- At first, Ella didn't really understand Skype. Don't get all tech-elitist on her, though. She was only 1. Back then, Ella would do silly things like try to hand her grandmother stickers through the computer screen during video chats, says her mother, Robin Riggs. But now, at age 2, Ella has come a long way. She understands now that her grandparents are five hours away, looking at her through a webcam, Riggs said. "She knows the noise the computer makes when Mimi and Papa are calling," she said. "She runs over to it excited." Skype playdates with toddler peers. "We've called her cousins a couple times that actually live down the street," Riggs said, adding that the weather was bad at the time in Wilmington, North Carolina, where they live, so a trip down the block would have been more difficult than dialing them up online. As it turns out, Ella is something of a technological trail blazer. As parents get busier and kids get more familiar with video-conferencing technology, the idea of a "video playdate" is gaining nascent acceptance in tech-enabled corners of America. While it's somewhat common for young children to conduct online video chats with adult family members, the idea of kids playing with each other via remote conferencing on laptops and TVs appears to be new, and hasn't gained mainstream acceptance yet. The trend comes with a number of potential complications. Young kids don't always understand how the cameras work. They sometimes veer out of the screen without warning, confusing their digital pals. It's sometimes hard to hold their interest in the presence of real-world distractions. And kids who chat via Skype are treading into new psychological territory. But tech researchers are trying to overcome some of these barriers. Lana Yarosh, a Ph.D. candidate in human-centered computing at Georgia Tech University, has been working with Microsoft Research to come up with ways for 7- and 8-year-olds to play with each other more freely "across distance." She has tested several add-ons to typical video chat systems that she hopes will make video playdates more engaging for children. In one method, kids hold a second camera, so they can show their friends the toys they are playing with up close. In another, playmates share a virtual playpen of sorts, where they see each others' toys and bodies projected onto the floor. Both of those prototypes helped the kids have more fun, she said. "They were jumping on top of each other. 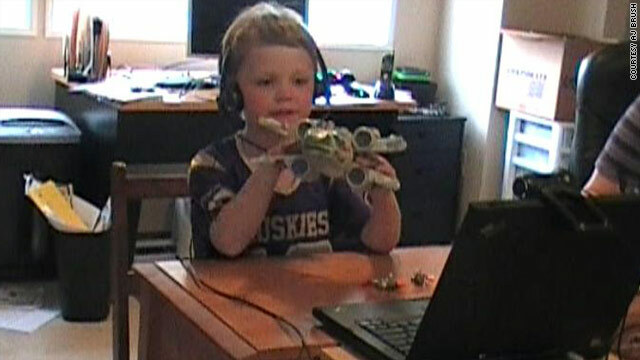 They were having battles," she said of two boys who took part in a research study by playing with a shared virtual space. "One of the kids said, 'This is a lot of fun and it's actually better than being in the same room because we're not hurting each other.' "
Yarosh says she sees video playdates as a way for friends to stay in touch when their parents can't drive them to each other's houses or to the park. "It's not the same. It's definitely more work for the kids to be in different rooms," she said of real versus video-conference playdates. "They have to work more at getting each other's attention. But we did see almost the same amount of social interaction with video conferencing as we saw with play in the same room." She says kids' video playdates won't be as rich or last as long unless current technology improves. Webcams need to have sharper resolution, so the kids can tell who their friends are and exactly what they're doing, she said. In the playdates, children engage in "free play," which is to say they come up with their own games and decide how they will be played. Those interactions are much richer than playing video games with set rules or watching TV, she said. "I don't want to totally rag on TV content ... but we know that the best thing for a child to have is verbal interaction with other people because that allows them to practice social skills, like negotiation," she said. Yarosh said she expects video playdate products -- like cameras for the Xbox or the Wii -- to start showing up on the market relatively soon. Once such tools become available, she expects the idea to take off quickly. In a few places, it already is. Avery, a 10-year-old in New York City, occasionally plays Pokemon cards through video conferencing with a friend in Australia, who he's never met except on the internet. His online buddy is the son of one of his mom's best friends. "I don't think either of them thought that the video thing was all that strange," said Avery's mother, Nancy Friedman, who recently blogged about her son's video playdates. "He really truly refers to him as 'my friend.'" Avery, who loves Pokemon cards about as much as anything, said he has nearly as much fun playing the game -- making up rules along the way -- through a video camera as he does on the playground at school recess. "The intensity [of the game] at recess is a little bigger because you have a short amount of time. We have recess periods that are pretty short," he said. "But it's fun online. Since they're not actually seeing you, you can switch Pokemon cards easier. And there are really open rules to it. But I think it's about even." Other kids are just happy to chat with each other over video. Carrington McDowell-Walsh, an 11-year-old who lives in Los Angeles, California, said she goes on Skype to gossip while she's browsing the internet. But she doesn't Skype with friends she sees daily. "The people I Skype with, normally I don't see them at all anymore. So it's really nice to see them there. I would prefer to 'see them' see them," she said, "but I don't otherwise." Laurie Zelinger, a Ph.D. child psychologist, said video playdates offer a good alternative to real-world play if a kid is sick, or doesn't have friends in the neighborhood. But she cautioned against parents thinking of it as a replacement for face-to-face playdates, which are more valuable for kids, she said. "It's better than texting and some of the other, more remote kinds of contact," she said. "However, I don't think it's a good substitute for in-person play opportunities." She added that kids today are increasingly stripped of face-to-face play time because they have busy schedules, because they live far away from friends and because saftey reasons prevent them from playing outside as much. Riggs, the mother of the 2-year-old who Skypes, said she'd like to use video chats to expose her daughter to the world outside North Carolina. She recently posted on a Skype message board that she wants her daughter Ella to start having playdates with a 2-year-old in another country. "She's got plenty of friends here. She has a little playgroup. But I was kind of looking for someone maybe in another country that had a little boy or girl her age that could maybe talk to her on Skype," Riggs said. She sees it as "just kind of a way to get her introduced to other cultures and other languages at an early age." So far, no one was written back. But Riggs is holding out hope. She hopes video chats will broaden her toddler's world.